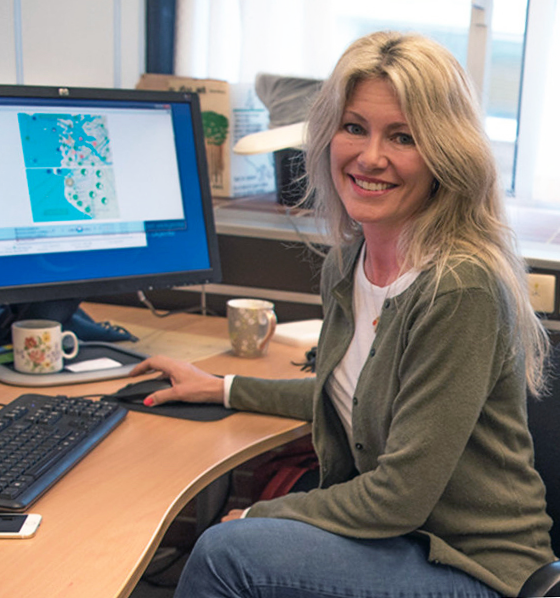 Roar Inge Hansen was the first meteorologist to be employed by StormGeo. For founder Siri Kalvig, he was the confirmation that her idea of ​​a private Norwegian weather company was a good one. "I will always be grateful that he dared to say yes to us. Can you imagine — I’m 27 years old and want to hire him to this startup company. It was a huge risk, but he had faith in it." Kalvig says, smiling. It has been 20 years since Hansen said yes to StormGeo, which not only gained a meteorologist, but one with weather as a passion. Early one autumn morning, we joined Roar Inge on a trip to Gullfjellet — one of Bergen's seven mountains. The 988 meter summit is a popular hiking destination, but Hansen is not going for the view. He's going to check his rain gauges. Hansen began measuring rainfall when he was just boy, using a simple cup and a notebook in his family's garden. He eventually wrote to the Meteorological Institute to tell them about his unusual hobby. The letter prompted the Institute to declare his home's garden an official Norwegian rainfall measurement station. Years later, a member of the Meteorological Institute knocked on his family's door looking for Roar Inge, a professional rain gauge in hand. At this time however, Roar Inge was away from home, working in the military. Hansen remembers, "They wanted to set up a gauge with us, and even though I wasn't there, my mother could not say no. She measured rainfall for them for 16 years, until she retired." Hansen eventually moved from Sunnmøre to Bergen — one of the wettest cities in Europe with an average of 240 days of rain per year. In 2004, he took advantage of this climate and set up his first rain gauges in the city and surrounding mountains. Just like the gauges of his childhood, these first gauges were also just simple buckets. To obtain daily reports, he had to check the buckets every day. Today, his gauges are automatic and can collect minute by minute data for weeks at a time. The gauges have a funnel on top that leads water into the gauge. The water then drips into cups fixed on a lever, like a pair of scales. When a cup is full (about .25 milliliters), the lever tips over, filling the next cup. Every time the lever tips, it is registered by a small data logger inside the gauge. 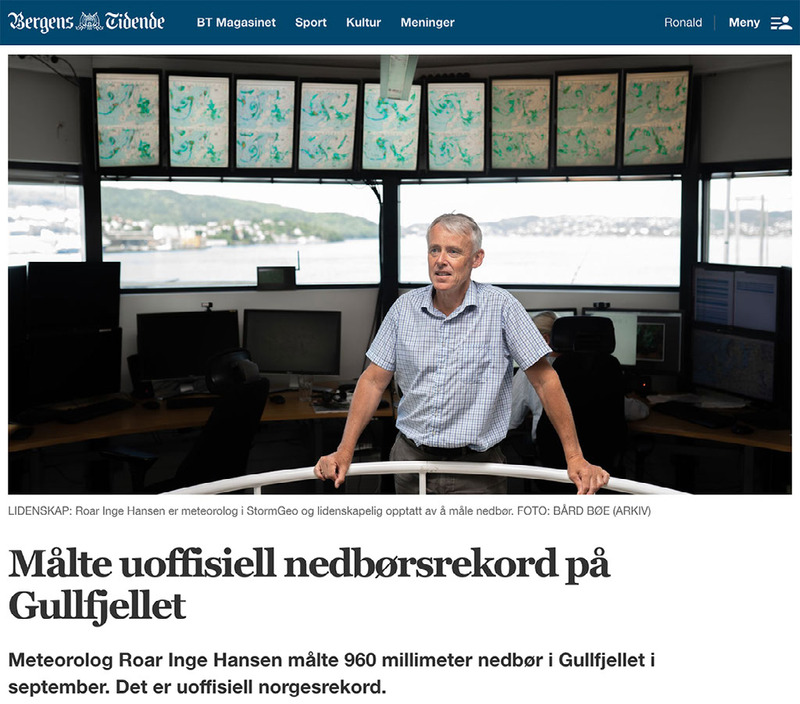 As Hansen checks this data log, he says, "I have eleven gauges in operation scattered around Bergen, so it takes a lot of time to go around downloading data. Why it rains so much more up here than it does down in the city puzzles me. But I’m just a very curious person who likes to figure things out." From Bergen going east into the mountains, Hansen's results show that precipitation increases by 50 percent in just ten kilometers. Up here on Gullfjellet, it rains 70 percent more than in the city center. "The meteorologists knew that it was raining more in Gullfjellet than in the city, but not that there was such a big difference," Hansen explains. 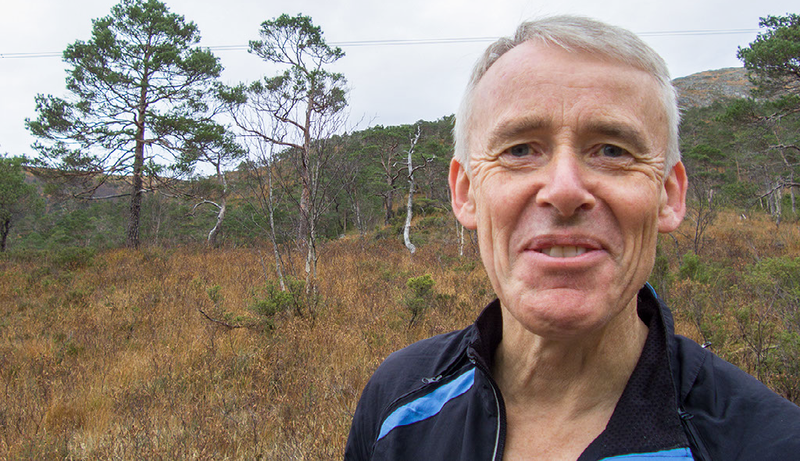 He has also found a correlation between the rainfall and the elevation, discovering the western Norway is different than the rest of the country. "Here, the precipitation increases less with the elevation than elsewhere. That is an important fact for a meteorologist." He continues, "Perhaps the most interesting thing is that it rains more on the leeward side of the mountains than on the windward sides in western Norway." In September, one of Hansen's gauges set an unofficial national record. "During September, three of the gauges on Gullfjellet measured more than 900 millimeters of precipitation. The station at Gullfjelltjørna measured 960 millimeters. This is well above the official national September record of 929 millimeters, measured in Hovlandsdal in Sogn og Fjordane in 1975. The story was soon picked up by local media. When asked if Hansen plans to continue doing this, he seems puzzled. "Continue? Sure I will continue. I hope that I can eventually use gauges that send data to me via the telecommunications network, but first the mobile coverage in the mountains must improve." Roar Inge packs his backpack, ready to move on. Three more gauges must be checked today, one of them 550 meters further up the mountain. The trip will take several hours, and the 60-year-old sets off at a run to get to each before it gets dark. Interested in learning more about how to set up rain gauges in your city or have other questions for Roar Inge? “I started tracking hurricanes when I was about four years old,” Hebert says of his childhood in the ‘50s and ‘60s. “My mother actually got me into it.” He got his first glimpse of nature’s power when 1964’s Hurricane Hilda struck the central Louisiana coast. In 2012, I was in Ethiopia working on a research project—collecting and studying mosquitoes to learn more about their behavior in an effort to eradicate malaria. The disease kills more than half a million people, mostly children, in Africa every year.